Industrial Heat Treating, Inc. (IHT) has been processing commercial heat treating in the New England area since 1942. 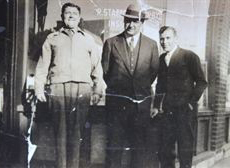 It is a third generation family owned and operated business that now reaches customers throughout the United States. We pride ourselves in having outstanding customer service and quick turnaround. As part of the manufacturing process we encourage our customers to allow us to participate with them in the production of a better product for their consumer. It is our goal to join our customer in delivering a superior product by choosing the right material from the start. Our employees are knowledgeable and experienced in the industry and are available to offer recommendations and suggestions to improve the end product. Industrial is currently certified by the Massachusetts Supplier Diversity Office as a certified Woman-Owned Business Enterprise (WBE) and a certified Disadvantaged Business (DBE). In 1941, the United States was in the midst of World War II. Manufacturing companies were expanding and older more established businesses were losing employees to these expanding companies. The Boston Consolidated Gas Company was no different. Five young men that had worked for Boston Gas decided they could help save jobs. They established a service department that would employ men from Boston Gas. As a result, Industrial Services of New England was born.